What Does PM Stand For In Crochet Patterns? What is a Place Marker and Why Does Crochet Need It? Once you know how to crochet basic stitches and you know how to read crochet patterns, it becomes possible to crochet almost anything that you want to make. Reading crochet patterns is fairly straightforward, but occasionally you will run into a crochet abbreviation that throws you off. PM is a crochet abbreviation for "place marker". This is a shortened version of the full instruction, which reads: "place stitch marker here". As the phrase suggests, when you see the crochet abbreviation PM inside of a crochet pattern, it means that wherever you currently are in the project is the place where you are now going to place a stitch marker. Many crochet patterns elaborate on the exact placement at this time, but if the pattern doesn't elaborate, then you should place the stitch marker in the last stitch that you made before reading this instruction in the pattern. Use a stitch marker when crocheting in the round. The stitch marker is used to mark the beginning of each round so that you can easily see where you are supposed to join the round. This is especially common when using short stitches, such as single crochet stitches, which may be hard to delineate in the round. Without a stitch marker, you may just continue crocheting stitches around and around, creating a spiral instead of joining rounds where you are supposed to do so. For this reason, stitch markers are often used when crocheting amigurumi and other circular projects. Use a place marker when working with certain types of yarn. Some yarn doesn't have very clear stitch definition, because of texture or color or both, and it can be hard to see where you are supposed to insert your crochet hook. Sometimes it can be helpful to use a place marker in these cases for separating one stitch from the other and knowing where to insert your hook. Use a crochet place marker when working across long rows. For example, a pattern may ask that you make 50 hdc stitches, "place marker" and then continue along the row. That might be because there's something that you need to do in the next row at the 50 stitch mark and it makes more sense to count that out as you do it than to try to find the 50th stitch in the next row. You can also use stitch markers every ten or twenty stitches in order to keep track of the length of long chains and rows. Use a crochet stitch marker when working with pattern repeats. 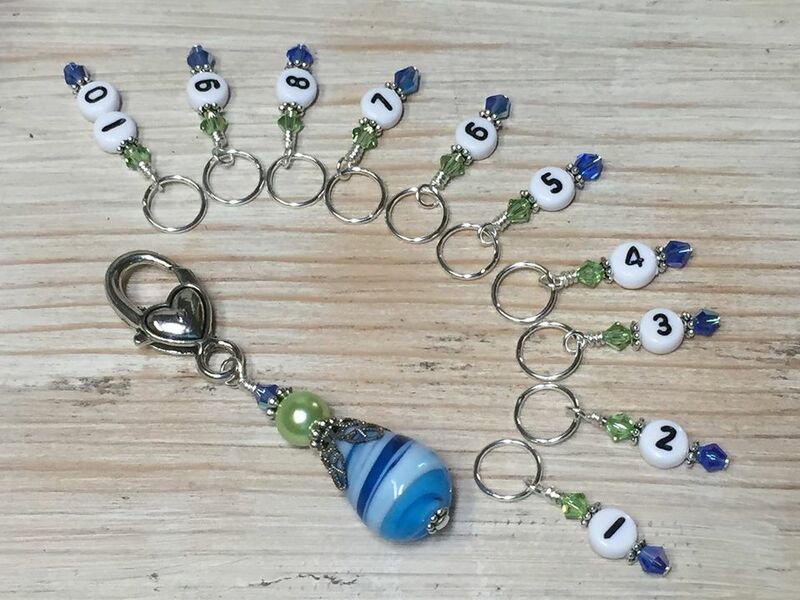 The stitch markers can be placed at the beginning and end of pattern repeats so that you know where the repeat begins and ends. Basically, stitch markers are helping you count your repeats in long projects so that you get your stitch and row count correct. Although there are many reasons that you might use stitch markers in your work, the important thing is that the crochet designer has seen a need for it and written it into your pattern. The designer has worked with the pattern frequently and intimately and believes that it's crucial for you to place the marker in order to get the pattern correctly worked in the way that they envisioned it. Since that's the case, it's usually wise to follow the instruction to "place markers", especially if you're a beginner crocheter or have never worked with this type of pattern before. Notably, if you are interested in making your own crochet designs, stitch markers can also be invaluable, because they can be used to mark different parts of your project throughout the design process. They are great for helping you keep count as you work! If you're designing your own patterns, consider whether you need to add a PM note for the people reading your pattern. In rare instances, you may see that a crochet pattern uses the term "SM" instead of PM. This means "slip marker" or "stitch marker" and is used in the same way as the PM instruction. Most crochet terms are unique to just this craft but there are some yarn terms that are used in both knitting and crochet. People who do both crafts may notice that the PM abbreviation is used to mean the same thing in either craft.